The first thing going in Age of Empires III’s favor is that it doesn’t just take Age of Empires 2, slap a 3D engine on it, and call it a day. That’s not to say that it radically alters the gameplay that made its predecessor so enjoyable. Instead it takes what was good, tweaks what was not so good, and adds some interesting new gameplay aspects that make it a worthy entry in the Age of Empires series. The original Age of Empires was set in Ancient Times and Age of Empires 2 was set in the Middle Ages. Age of Empires III continues this progression and is set during the age of colonization as eight European nations vie for control of the riches of the New World: Spain, Portugal, England, France, Holland, Germany, Russia, and the Ottoman Empire. Each of these nations has its own set of bonuses, such as England’s bonus of receiving free peasants each time a new house is constructed. The move to the Colonial Age brings with it certain new aspects of gameplay. The first of these is the inclusion of a Home City for each nation. This represents the production and supply base provided by the homeland back across the sea and the Home City is a source of units and resources during gameplay. These supply shipments can be purchased for experience points gained by the progress you make in the New World by collecting the local resources, building structures, and, of course, killing enemy units. Collect enough experience and you can even upgrade your Home City, making new types of shipments available to your New World bases. This allows you to customize your city to your style of play – do you want your Home Coty to provide you with the means to quickly conquer your neighbors with military might or to supply your economic powerhouse? 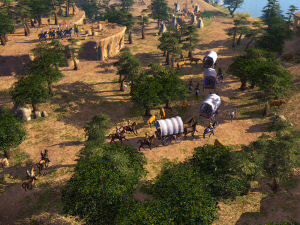 Another new gameplay feature new to Age of Empires III is that the maps include indigenous peoples. While this does mean that you’ll be subject to raids or to have your ships cross paths with war canoes, there’s more to it than that. Maps will have native villages and trading posts that can be captured and developed by players. The villages are sources of military units and technology upgrades and the trading posts are sources of experience points and resources. As you can probably guess, locating and capturing these sites early in the game is key to victory.